SKU: N/A. Category: JUMPING HORSES. EXCLUSIVE - high-quality design in brilliant colours! For the most noble reproductions of highest quality, a print on acrylic glass is recommended. The modern photo-print directly to the back of a polished 5 mm panel of acrylic glass impresses with a high-gloss look and intense and brilliant colours, lending special three-dimensional depth and timeless elegance. It creates a museum-like appearance and an incredible depth while offering optimal protection against exposure. Thus you receive optimal stability and longevity, and nothing shines through. The acrylic glass already comes with 4 holes and mounting (look at the photos at DISPATCH). Shipment in a special packing. With the choice of paintings presented here you can have your passion for horses come true to your taste at your own walls. By way of a special procedure the reproduction comes very close to the original painting. The latest printing technique is used for a brilliant authentic rendition. The high-end quality shows in the colour intense rendition of the motifs. The artist´s canvas is individually mounted onto each stretcher frame (margin 1.8 cm). The different formats allow an optimal fitting to your rooms. Shipment in a special cardboard box. 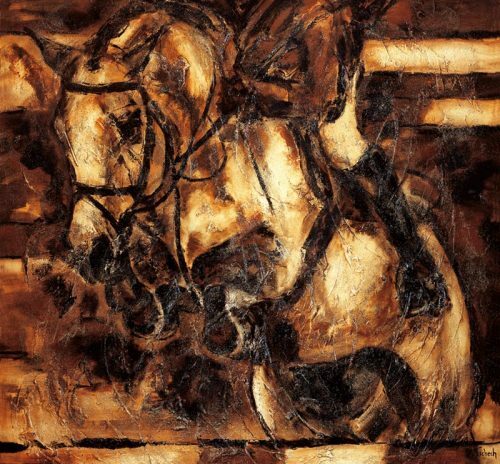 The appeal of this exclusive reproduction lies in the texture, which is applied by hand and accounts for the vividness of the painting, emphasizing the horse´s spirit and the vibrant motion. All reproductions are custom-made and come very close to the original. The primed canvas is mounted on wide wooden stretcher frames and imprinted using latest techniques with considerable expenditure. The width of the stretcher frame of 4 cm creates a museum-like appearance. 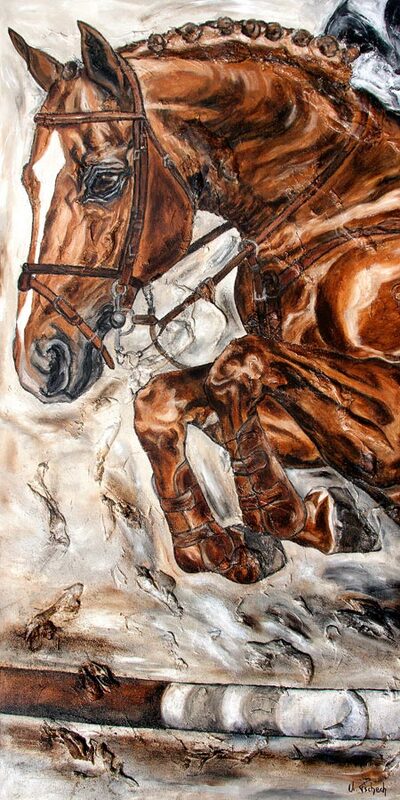 This high-quality Horse Artprint made from an Original Horse Painting from Kerstin Tschech, may individually be furnished with a frame. This eyecatcher is printed with a white margin on noble 300 g chromolux paper, which impresses with colour brilliance and colour saturation. The Fine Art Print with a special Horse Motif can be mounted on a wooden panel and cut to size, to come as close as possible to the characteristic of the Original. This way larger wall areas may be appealingly decorated with matching components. The Art Print is coming with a cardboard backing and are shrink-wrapped in foil. Shipment in a sturdy packing. The result of this modern printing process results in something very close to an actual painting, the effect furthermore emphasized by the simple elegance of the aluminum. The non-fading UV direct print on a 3 mm aluminum base panel allows for indoor as well as outdoor placing of the piece of art, making it also suitable for riding halls, offices, terraces etc. A transparent varnish provides protection against UV-rays, moisture and scratches. Dear friends of Arts and Horses, to take delight in the fascination horse even in your home, you will find a variety of horse motifs here on this site. 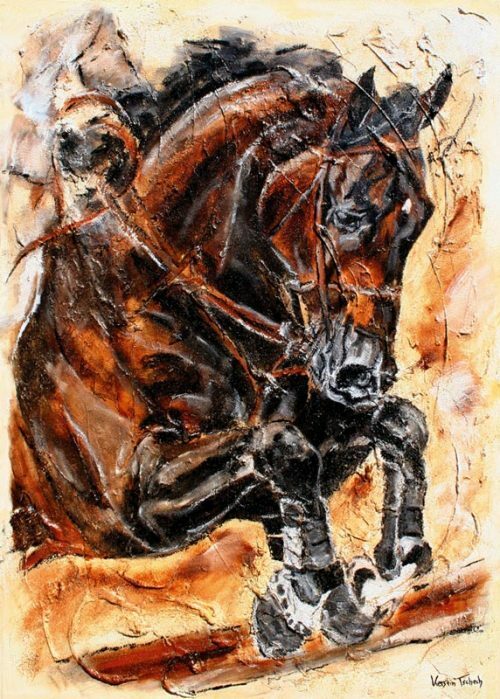 The offer ranges from high-quality Horse Art Prints to hand made Reproductions with Texture on Canvas, which can be individually customized for you. All Horse Art Prints on www.pferdekunst.com are printed in Germany with the most modern and environmentally friendly technology.